Are you ready for a night at the disco? Too 1970's for you? Don't worry because this disco is all about waging good old-fashioned high-school dodgeball war against your opponents in some pretty crazy environments! I don't think I have ever seen a game with as many health warnings that actually deserve it. 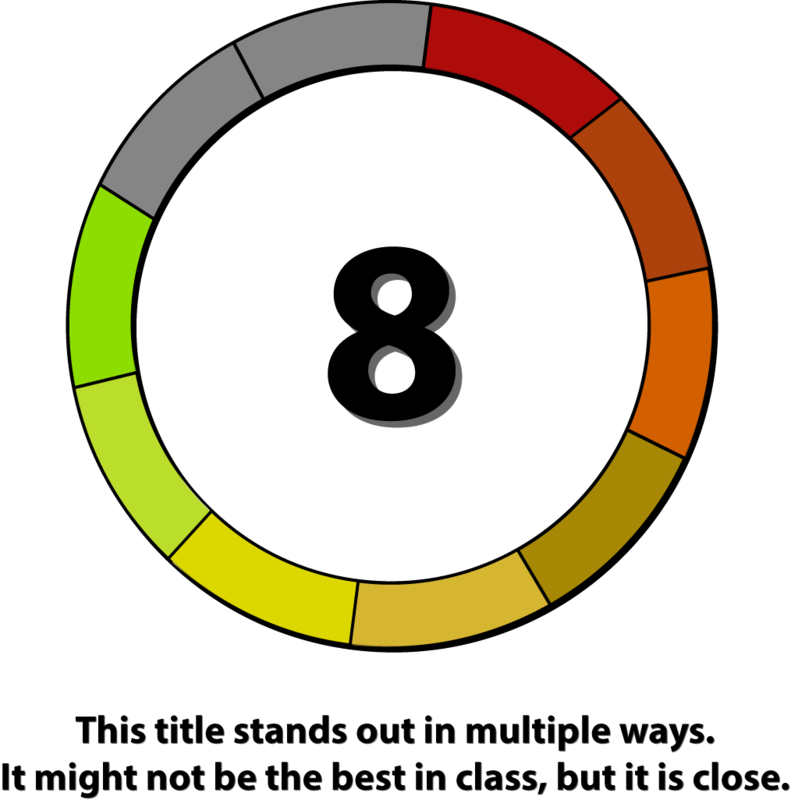 If you have epilepsy, or any visual sensitivities, you probably want to take it easy with this game. 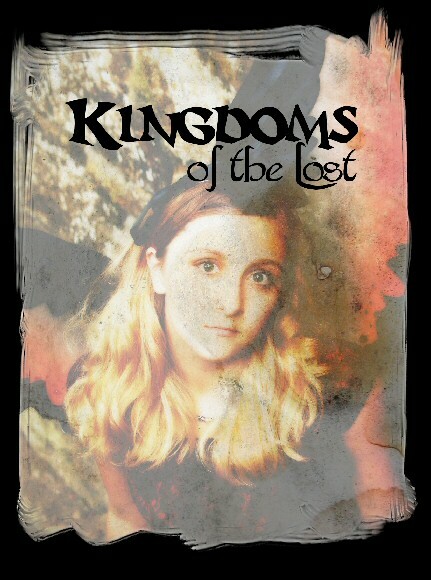 There is a photosensitive option, but we didn't test it. Also, I was definitely expecting disco music given the game's title, so I was a little sad that the entire soundtrack sounds like early 2000s dance music. No Bee-Gees here. There isn't a plot. 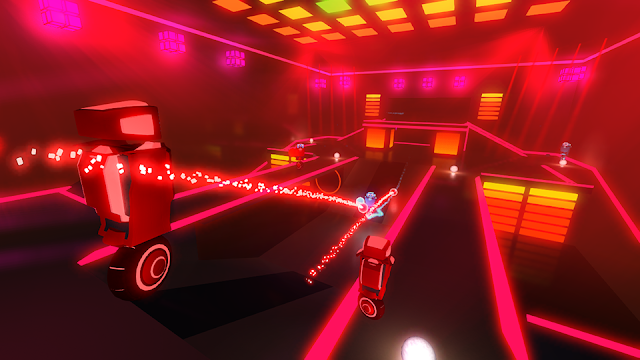 The entire point of this game is to hit robots (on wheels) with balls. And that's awesome. I definitely recommend playing the tutorial to get the hang of movement and hitting enemies. Unlike most games, you don't stop moving when you let go of the joystick - you glide a little until either you come to a stop or hit an obstacle. You have to hit the brakes if you want to stop quickly. You might also want to practice timing to catch the balls thrown at you by enemies, which counts as a KO in your favour. 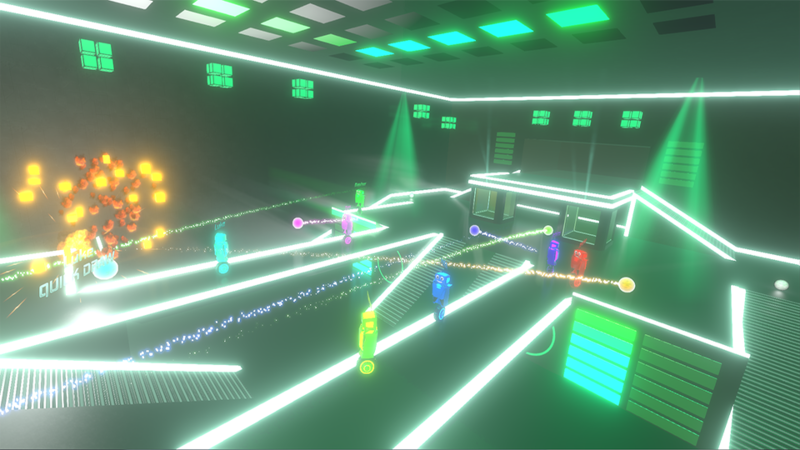 Disco Dodgeball Remix offers single player, couch co-op and online multiplayer. From there, you can choose one of several game modes, or have the game pick a random level and mode for you. In single player Arcade Mode, you can play challenges to unlock cosmetic items and special moves. You play against bots that are either named after your friends (there was seriously a bot named Lauren when my husband played) or named randomly like Vern or Trevor. They are randomly generated and some of the accessories are fun and ridiculous. You pick up balls by running over them with your bot and then throw with whatever assigned button based on your control set up. You also pick up various perks the same way. These perks, like "boomerang" and "pogo stick" take effect instantly but you can only have one equipped at a time, and you lose it if you are KO'd. There are over 20 types of game modes - so I won't break it all down for you here. Some of the more basic modes include elimination matches and score battles, which are exactly what they sound like. 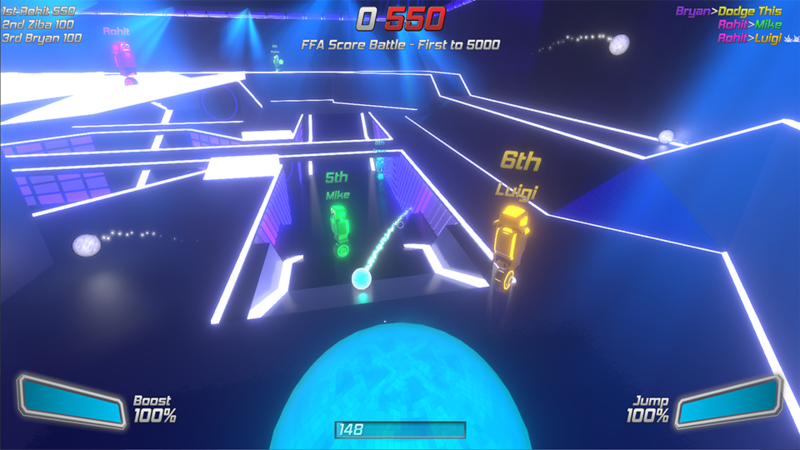 There is a "hoops" mode where you have to launch a specific type of ball at a giant square and there is a level where you gain points by holding a golden ball for the longest period of time. They also mixed these modes to make Galaxy Jam where you have to use a super ball to hit "hoops" and use jetbacks and pogo stick perks to get an anti-gravity style game. From what we were able to test, this is the only level where you can score a KO by sprinting into an opponent. I really enjoyed the Capture the Cube level, but it would be even better with more than 2 players. 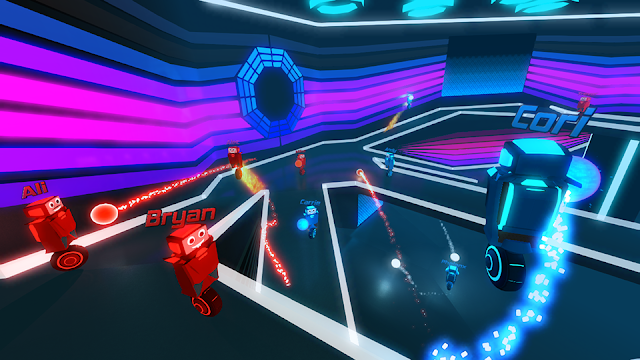 For those of you who don't want to be hit by dodgeballs, there is even a mode called Kart Race where you roll around trying to reach all the checkpoints faster than your opponents. Although I initially found the movement and aiming to be a little frustrating, the game was a heck of a lot of fun once I got used to it. There are so many different modes and arenas that we didn't find it repetitive at all and there truly is a mode that should appeal to every style of gamer. 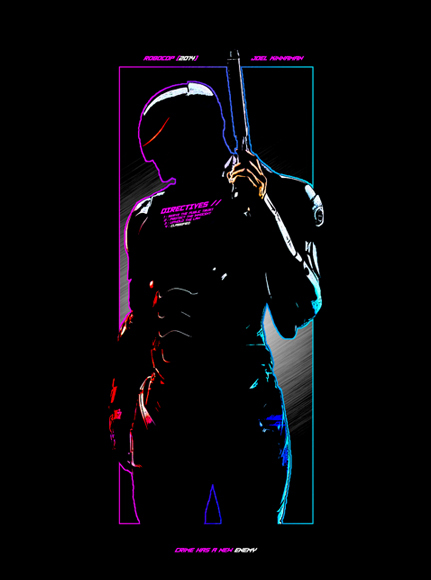 I can't wait to play it online with more people once it becomes available.